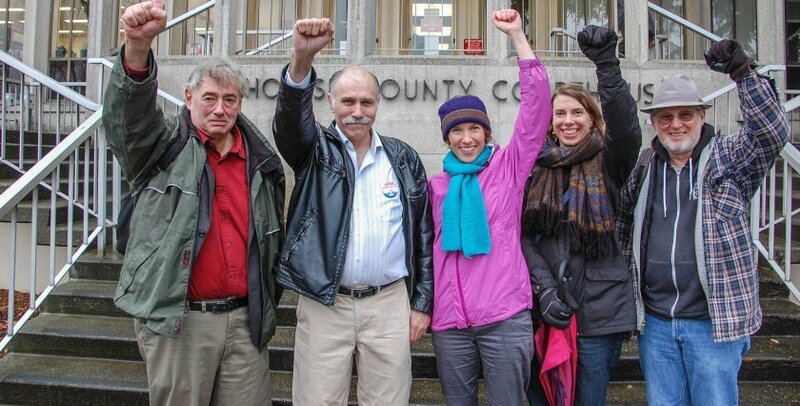 History will be made later today in an unassuming grey court room in Snohomish county in Washington State, when five activists – known as the Delta 5 – who blocked an explosive crude by rail train last year, will argue that their actions were justified by the threat of climate change. It is the first time ever that a US court has allowed defendants to use the “necessity defense” in a case relating to climate action. 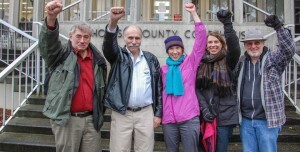 In September 2014, the five activists — now known as the Delta 5 — blockaded a crude by rail train carrying highly explosive Bakken crude in the BNSF Delta Yard in Everett, Washington State. The five – Patrick Mazza, Abby Brockway, Mike Lapointe, Jackie Minchew, and Liz Spoerri – managed to stop the train for eight hours. They were eventually released and charged with “criminal trespass” and blocking a train. One of the five, Patrick Mazza, has been working since the late eighties to advance solutions to the climate crisis. He has worked with power grid experts building smart grids to power electric vehicles, solar panels and wind turbines. He has worked with electric vehicle companies and to promote sustainable fuels. “I continue to work on practical solutions. I won’t quit,” he says, but he still felt that he had to do more to protect the climate. The third of the five to put her body on the line for the climate that day was Liz Spoerri. “It was clear that the political reality is not keeping up with the physical reality, and that citizens need to lead”, she says. In their defence the Delta 5 will call expert witnesses including Dr. Richard Gammon Professor (Emeritus) of Chemistry and Oceanography, and Adjunct Professor (Emeritus) of Atmospheric Sciences at the University of Washington. Gammon was a co-author of the first Scientific Assessment by the Intergovernmental Panel on Climate Change in 1990. The day before Patrick Mazza spent eight hours blocking the rails, it was his daughter’s eighteen Birthday. “There is hope for her world and that of all our children, but not if we stay within the bounds of a blocked and bought-off political system,” he argues. For more on the trial go here.